Do you have a freezer full of pork chops (due to an amazing sale, of course), and are looking for a few different ways to fix them? 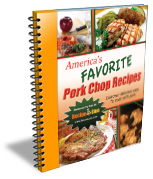 Well, here is a free printable e-cookbook called America's Favorite Pork Chop Recipes. It is filled with 32 different Pork Chop recipes....from grilling to making casseroles there are plenty of great recipe ideas for you to consider! !